Recipe: The Gods' Constipation Medicine. Home Recipes The Gods' Constipation Medicine. I'm not a medical doctor and the following article should be read only as a layman's guide to good health. You might wonder what an article about constipation is doing in a section on recipes. I too pondered if this was the right place. The following should explain why it's the perfect place for it. I've been researching the obesity epidemic and the related ailments including heart disease, and type 2 diabetes. The good news is that the experts are pretty much in agreement on the causes and the evolution these ailments. The short explanation is overeating induced by highly processed foods leading to obesity, insulin intolerance and so on down the line. The bad news is that these same experts are in total disagreement on what a proper diet should be beyond recommending not eating highly processed foods which are chock full of harmful ingredients and formulated to be highly addictive. My first step was to develop a diet that works for me. I've lost 40 pounds and several inches around the waist over these past five to seven years. My second step is to try to eliminate the medications I have been taking for several decades to control heart disease and type2 diabetes as well as chronic constipation. I recently discovered why cacao is so good at relieving constipation and I want to spread the news. The two should not be confused. 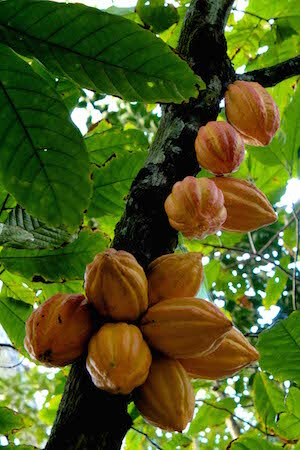 Cacao is the unprocessed nut of the cacao plant -- Theobroma cacao. At most it's roasted to enhance the flavor. Cocoa is a processed product that can have any number of added ingredients like sugar, fat, and flavors. This article refers to cacao only. If you find the taste too bitter you may substitute cocoa in its place but be aware of the added ingredients it contains. Aside from medical conditions, constipation in modern living is caused by two main factors, not enough fiber in the food we eat and our gut not letting the waste material go through. Fixing one without the other does not give good results. Too much fiber can block the passage through the digestive tract and too much laxative causes diarrhea. I've suffered from both. The solution is in your kitchen, no need to go to the pharmacy to buy medication or to buy supplements. Fiber you get from eating fruits, vegetables, legumes, grains, nuts, and just about anything from the vegetable world. Even if you drink enough water and eat sufficient fatty foods, the waste material might not go through fast enough. A very likely cause is a lack of magnesium which relaxes your intestines. That's how milk of magnesia works but you can get the magnesium from tasty food instead! Theobroma literally means "food of the gods" from the Greek theos meaning "god" and broma meaning "food." Cacao is the Spanish version of the Maya "kakaw." The native Americans believed that such a miraculous food could only come from the gods. Indeed, the nutritional content of cacao is exceptional. This is not the place to sing the praises of cacao, instead I've provided a Google link for further research. 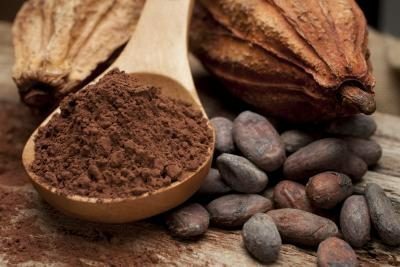 For this article suffice it to say that cacao is one of the foods richest in magnesium which relaxes the intestines among other good works it does. Eat too much chocolate and you'll get diarrhea. What has worked for me extremely well is to drink a mug of hot cacao after dinner. I like to use a two cup beer mug and four heaping teaspoonfuls of cacao powder. You might want to use a regular coffee mug with half the cacao and adjust from there. Put two to four teaspoonfuls of cacao powder in the mug, depending on the size of the mug. Fill to a little over half with boiling water and stir vigorously. Top up with boiling water and continue stirring. The cacao has a lot of insoluble fiber and you'll have to continue stirring it while you sip it as otherwise a thick sludge will settle on the bottom. The Aztecs believed that cacao has aphrodisiac properties. Drink it between dinner and bed time. Happy dreams!